Director Emeritus Jerry Dempsey died March 12, 2019, in Greenville, S.C., at age 87. The chairman and CEO of PPG Industries from 1993-1997, he served on Pittsburgh Seminary’s Board from 1990-1999. In 2006, he and his wife, Harriet (who died in 2015), established The Jerry and Harriet Dempsey Scholarship at PTS. A native of Landrum, S.C., Mr. Dempsey was the son of textile mill workers. He grew up in a house with no indoor plumbing and only a wood-burning stove for heat. From his youth, he dreamed of running a major American corporation and knew he’d need to save his money if he hoped to go to college. So twice a day he pedaled a 12-mile newspaper route on his bicycle and raised chickens to sell from the back of his wagon. Thanks to his later summer work on oil barges and to scholarships, he was able to enroll at Clemson University. He graduated first in his class with a degree in mechanical engineering. Later in life, he received multiple awards from Clemson for his leadership on its boards and councils. Six months after graduating from Clemson, he left his first corporate job to serve in the military. Mr. Dempsey achieved his boyhood dream when he became COO of Borg Warner, then president and CEO of WMX Technologies, and finally chairman and CEO of PPG Industries as the first outsider hired for a top job in PPG’s 110-year history. 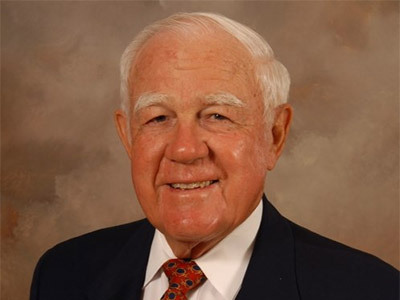 He retired in 1997 and relocated to Greenville, where he served as board chair of the Greenville Health System, a director of the Greenville Country Club and Greenville Symphony, and an elder of First PC of Greenville. The Horatio Alger Association honored him in 1995.